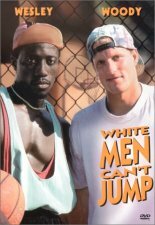 The hit full-court comedy from writer/director Ron Shelton ("Bull Durham") stars Woody Harrelson and Wesley Snipes as a pair of basketball scam artists who pull their money-making hustles on the playgrounds of Los Angeles. With Rosie Perez, Tyra Ferrell. 115 min. Widescreen (Enhanced); Soundtracks: English Dolby Digital Surround, French Dolby Digital Surround; Subtitles: English, Spanish; music video; theatrical trailers; TV spots; deleted scene; scene access.